Peat free and British Standards Institution (BSI) PASS100 accredited. Green credentials: 100% UK sourced (all from Yorkshire to be precise), 100% recycled, 100% feel-good factor. Available in single, twenty and fifty bag (full pallet) deals. Yorganics is a peat-free compost made from 100% recycled garden waste. 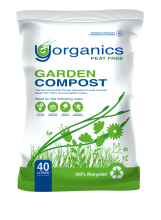 Yorganics is the environmentally sound alternative to peat based compost. Do you know what’s in your compost? Do you care? Despite growing ecological concerns, peat remains the most popular medium for UK. Life is too complex to get every ethical decision right. Buying Yorganics, however, is one easy win. Yorganics a 100% recycled, peat free, Yorkshire sourced and Yorkshire produced compost. Revitalise and restore nutrients to your soil. Hold nutrients and water in the soil, releasing them when required. Recover heavy soil making it more workable and improving drainage. Available in a handy 40l carry bag or delivered 800kg dumpy bag (call for details on bulk orders).